Big data adoption in enterprises soared from 17% in 2015 to 59% in 2018, reaching a Compound Annual Growth Rate (CAGR) of 36%. Amazon Web Services (AWS) S3, Spark SQL, Hive, and HDFS are the most popular big data access methods with AWS S3 is growing most quickly in 2018. 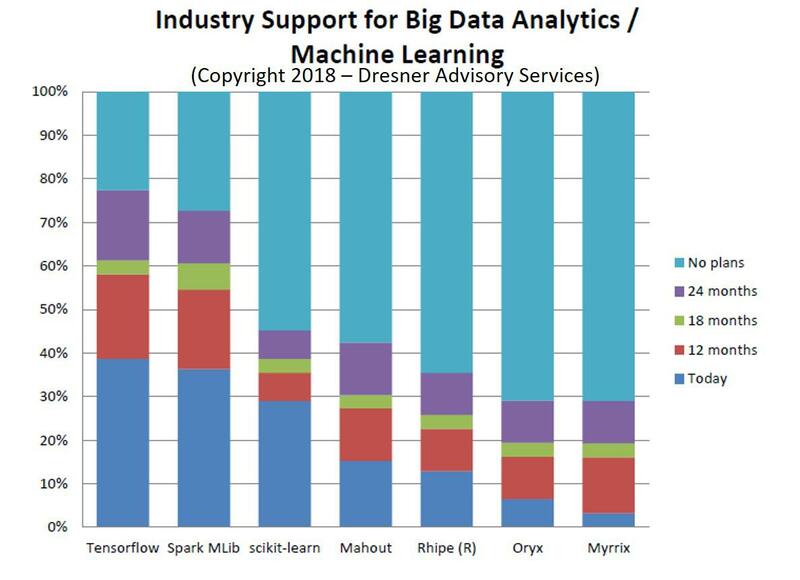 Apache Spark MLib and Tensorflow are the most-adopted big data analytics and machine learning technologies in enterprises today. 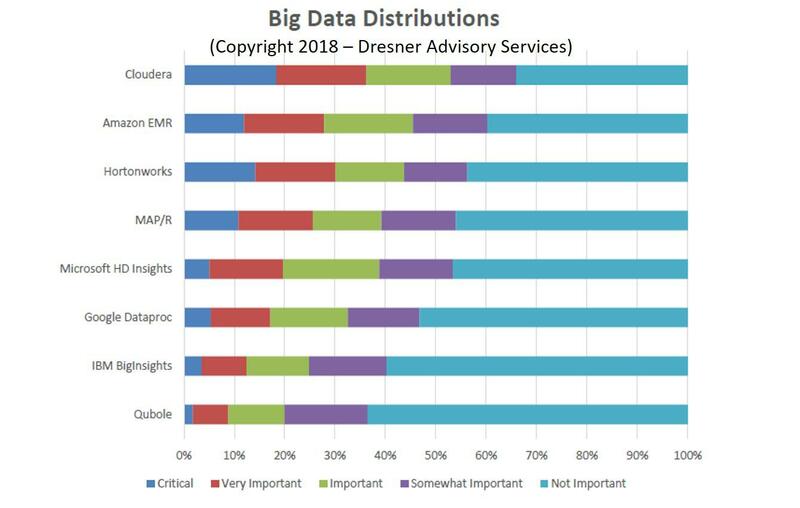 Cloudera, Amazon EMR, Hortonworks, and MAP/R are the most popular big data distributions by enterprises in 2018. 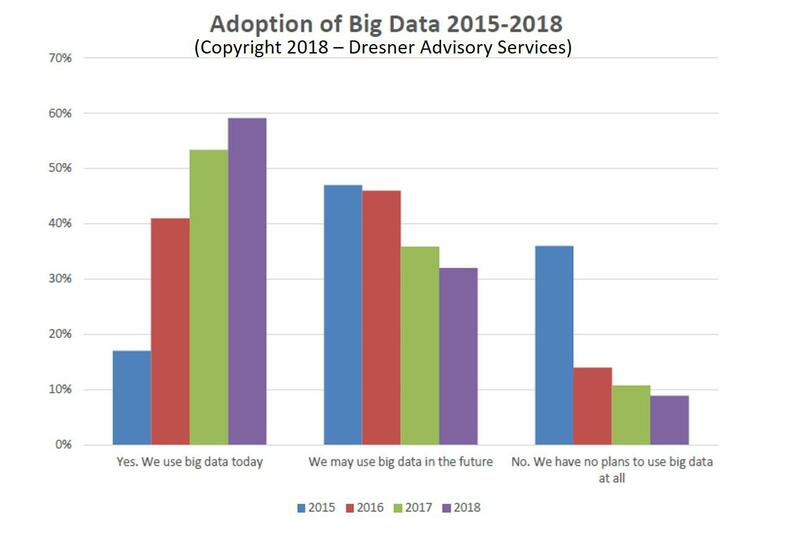 These and many other fascinating insights are from Dresner Advisory Services’ 2018 Big Data Analytics Market Study part of their Wisdom of Crowds® series of research. 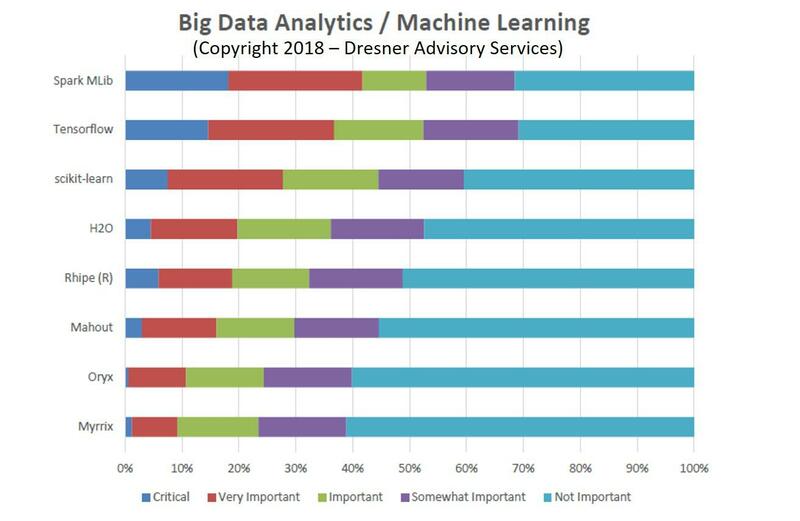 This is the 4th annual Big Data Analytics report the firm has done, examining end-user trends and intentions surrounding big data analytics, defined as systems that enable end-user access to and analysis of data contained and managed within the Hadoop ecosystem. Please see pages 13 through 16 for additional details on the methodology. 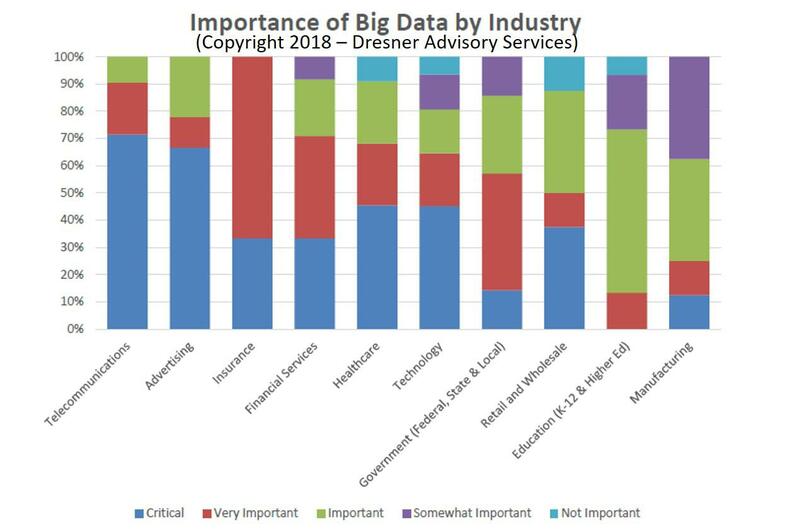 Telecommunications, advertising, and insurance are the three industries who say big data analytics is the most critical to their business intelligence initiatives. Healthcare and retail & wholesale industries rank big data analytics as essential to their ongoing business intelligence initiatives as well. 80% of all enterprises say big data is, at a minimum, important to their business intelligence initiatives. 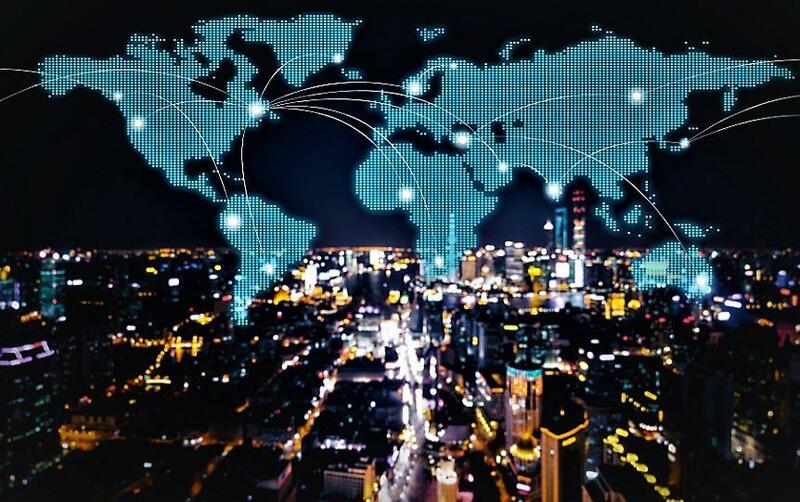 Big data adoption in enterprises soared from 17% in 2015 to 59% in 2018, reaching a Compound Annual Growth Rate (CAGR) of 36% according to the study. Today less than 10% of enterprises have no plans to use big data at all in the future, an indication of mainstream adoption. The following graphic compares adoption trends between 2015 and 2018. Telecommunications (95%), Insurance (83%) and Advertising (77%) lead all industries in big data analytics adoption according to the study. Financial Services (71%), Healthcare (64%) and Technology (58%) enterprises are the next groups of leading adopters. 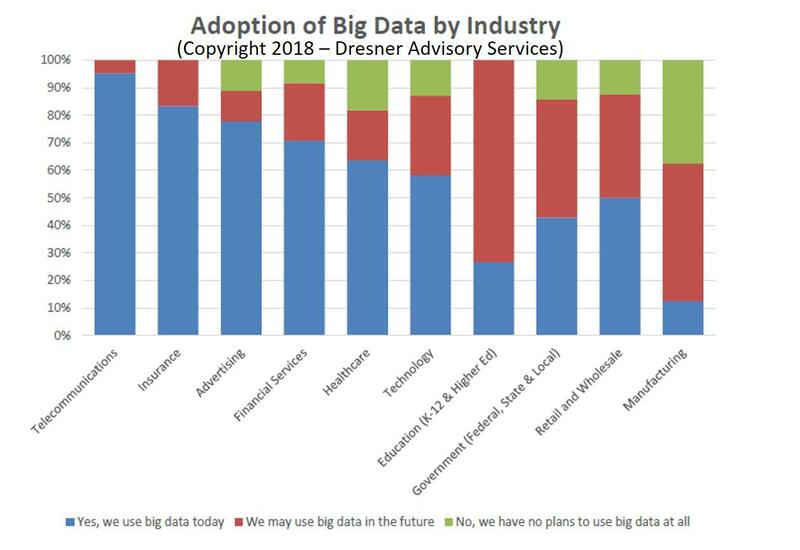 The study also found that Manufacturing, Retail/Wholesale, Government, and Higher Education institutions are the least likely current users, though a majority of these enterprises anticipate using big data in the future. 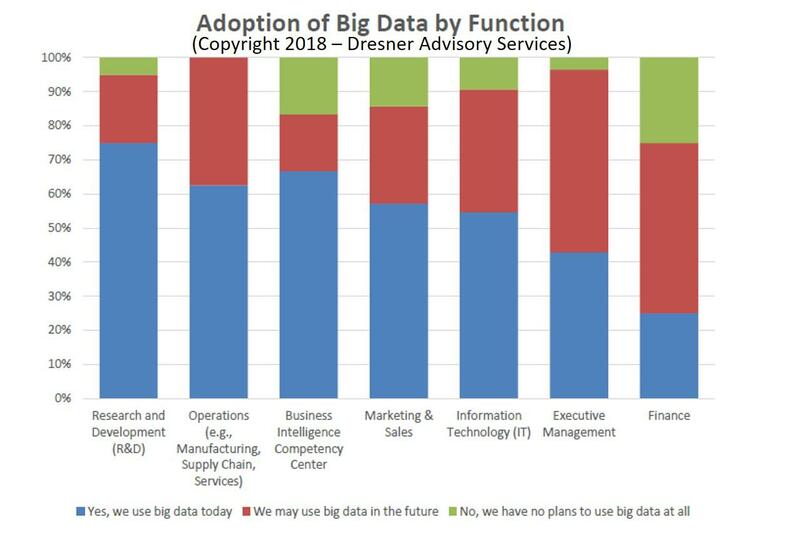 Big Data is going through a strong cycle of development and deployment in enterprises, as reflected by R&D (75%), Business Intelligence Competency Center (BICCs) (65%) and Operations (63%) leading adoption. Marketing & Sales and IT show median levels of adoption with plans to adopt big data analytics for future business intelligence initiatives in the future. The study found Finance trails other departments in their plans for adopting big data architectures and technologies. 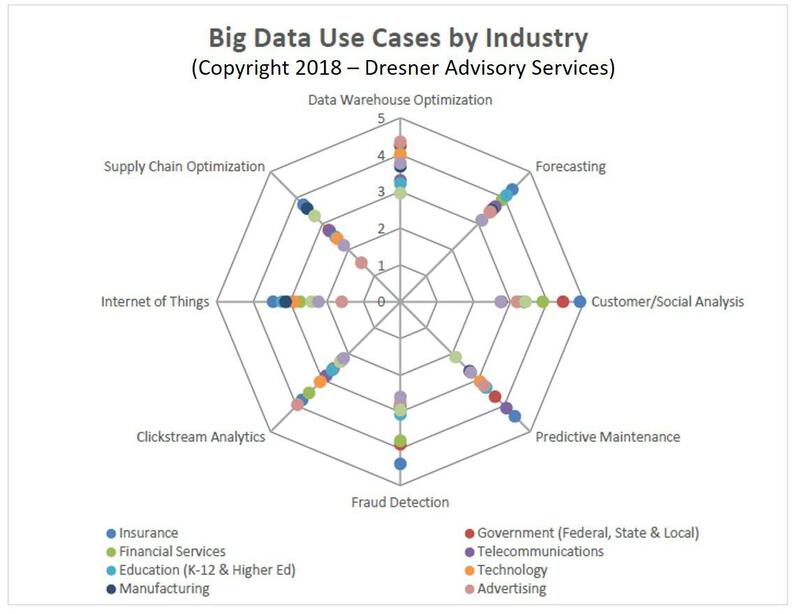 Data Warehouse Optimization, Forecasting and Customer/Social Analysis are the three most critical big data analytics use cases in enterprises today. With two operations-centric use cases being at a minimum important to enterprises, it’s another indicator of big data analytics’ adoption growing. Customer/social analysis is a use case marketing and sales rely on to plan, execute and evaluate product and selling strategies regularly, reflected by its high level of importance across all respondents. Manufacturers are turning to analytics to gain greater insights into how they can improve shop floor efficiency and product quality at the same time. Predictive maintenance is a core part of many manufacturers’ strategies to find new ways to increase production throughput and quality concurrently. 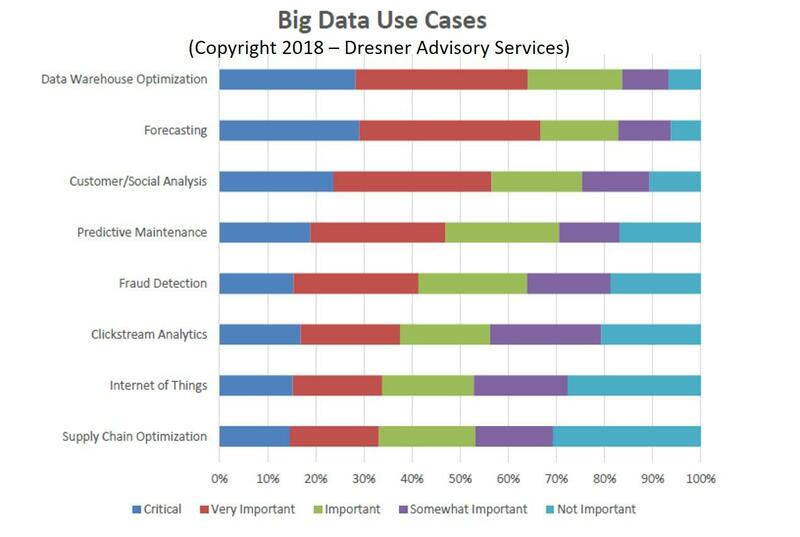 Big Data use case priorities vary significantly across industries with Data Warehouse Optimization being highest in Advertising and Government. Insurance leads in the use case areas of Forecasting, Customer/Social Analysis, Predictive Maintenance and Fraud Detection. Manufacturing is prioritizing the use of big data analytics for Supply Chain Optimization. Advertising dominates Clickstream Analytics and Data Warehouse Optimization use cases across all interviewed industries included in the study. 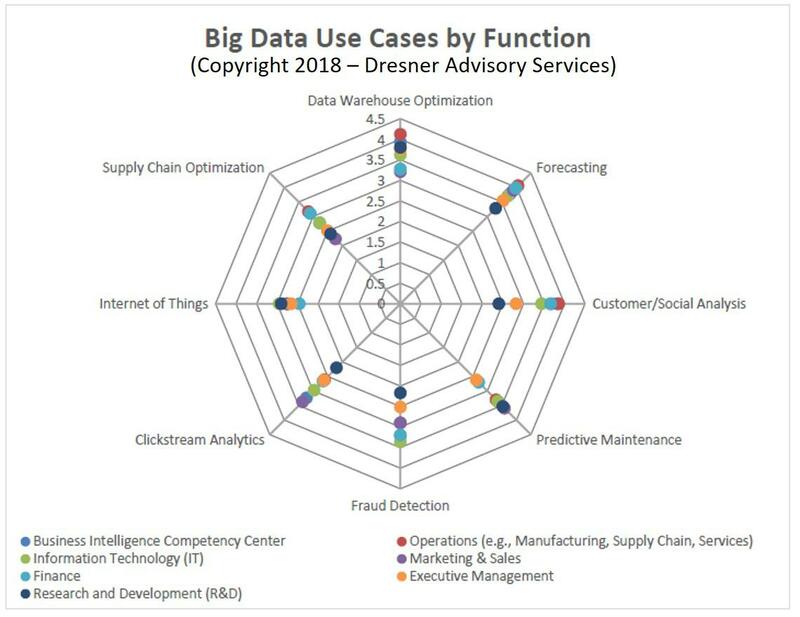 Data Warehouse Optimization, Forecasting, and Customer/Social analysis big data analytics use cases are strongest in Operations. Finance reports very high interest in Forecasting while Marketing & Sales respondents are most likely to track Clickstream Analytics to test customer behavior. R&D interest is relatively low in all use cases except Predictive Maintenance and Internet of Things which signals that other use cases are more likely in use or considered ready to deploy according to the study. Apache Spark MLib and Tensorflow are the most adopted big data analytics and machine learning technologies in enterprises today. Scikit-learn ranks third with a minimum score of "important" to 44% respondents. It’s noteworthy than H2O and Tensorflow were added for the first time this year. 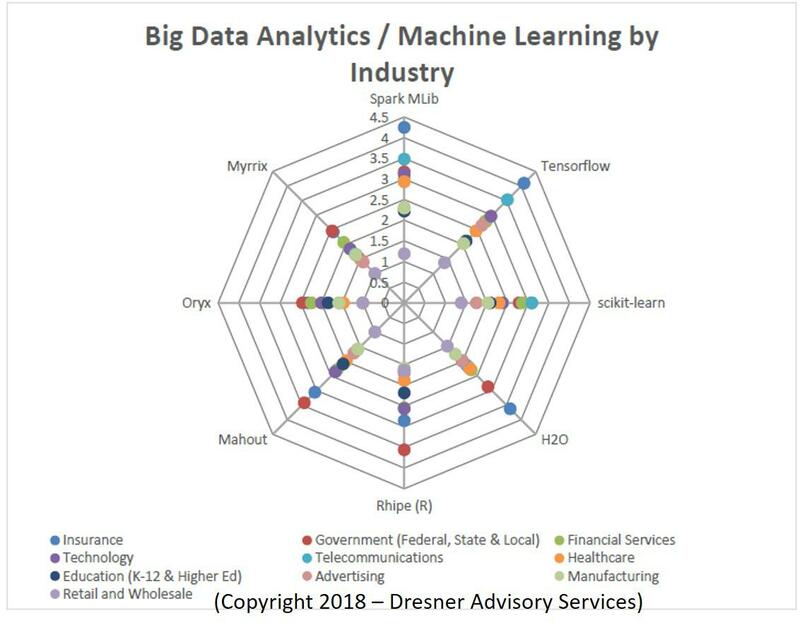 Big data analytics and machine learning frameworks vary significantly in adoption across industries with Insurance rating Spark MLib, Tensorflow, and H2O the highest value. Telecommunications enterprises show the highest interest in scikit-learn, while Government agencies are most favorable to all other technologies, particularly Rhipe and Mahout. Cloudera, Amazon EMR, Hortonworks, and MAP/R are the most popular big data distributions by enterprises in 2018. The study found that Cloudera is the strongest overall performer in enterprises today followed by Amazon EMR, Hortonworks, and MAP/R. Cross-industry support for Tensorflow and Spark MLib continues to accelerate, making both key standards all enterprises need to develop expertise in to stay competitive. 39% of all enterprises participating in the study are using Tensorflow today, with enterprises predicting they will increase their support to near 80%. 36% of the enterprises are using Spark MLib today, with adoption predicted to reach 70% within 24 months. Apache Spark MLib and Tensorflow are the most adopted big data analytics and machine learning technologies in enterprises today. Scikit-learn ranks third with a minimum score of “important” to 44% respondents. It’s noteworthy than H2O and Tensorflow were added for the first time this year.